This is a community for the Alto Guitar players of the world. This is the place to go to connect with other players, luthiers and enthusiasts of Altgitarren. The Alto Guitar is a fairly new instrument, constructed in the 60s by the swedish luthier, piano- and furniture maker George Bolin. In swedish it's called "Altgitarr", which means Alto Guitar. 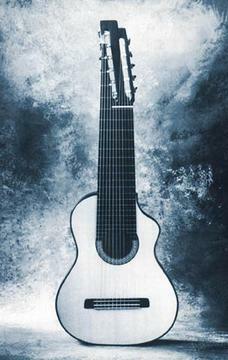 It usually has 11 strings, but some models have up to 13. Eventually there will be an article up with more information about the instrument. Also you may upload pictures in the gallery, maybe of your instruments, or of you when you play masterclass. On the forum there is a file archive where you may upload sheet music, tabulature, audio and other media. way remotely assiciated to Alto Guitars, Lutes or other instruments and music of interest. But most of all, you're welcome to join in a community of many talented musicians from all over the world. Welcome! Make this place yours.